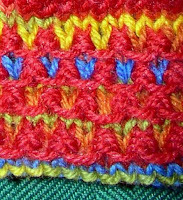 The pattern is written for that red thing, in one size only so far. Things were slow at work, so I started the pattern on my laptop. I wanted to use Aran Paint for the cable chart, but don't have it on that computer. It took a while to find out where the charts are filed on the desktop in a form that can be imported into MS word. That's done. Then I remembered that I needed a key to the symbols. That's done too. Now to put in the numbers for the larger sizes. The sample is in size 2. 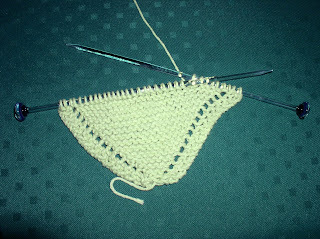 The body is finished, including the neckline. Sleeve #1 is almost done. This is the snails part of the design. My DH won one glass needle at a TKGA convention in Oakland CA. It was door prize that was a teaser. I bought the other needle. Sheila Ernst makes them. They're Pyrex, so not easy to break. I picked them by the flower at the nob part, not caring what size they were. They're size 8 and very nice to work with. Oooh, those look like they'd be fun to try! !